This will really only mean something to people who live/have visted Ottawa. T&L is a huge sporting goods store, there are a few of them around Ottawa. This one was down the street from Slaysh. The three-alarm fire broke out just before 1 a.m. and crews were still on the scene Tuesday morning dousing hot spots. Nearly 100 firefighters were at the scene. Platoon Chief Dennis Gobey said when fire crews arrived they found heavy smoke and flames were already coming from the roof. The department had 20 vehicles at the scene and had to call in off-duty firefighters to help battle the fire. 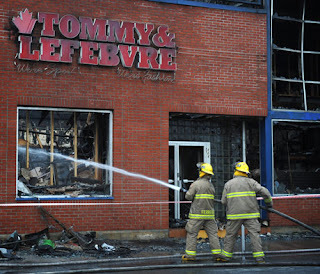 Gobey said part of the store is so badly damaged that demolition crews will have to be called in before investigators can begin looking for a cause.